Are you looking to upgrade your home's roof, windows, or siding? Have you had issues with storm damage to your house and no luck with your insurance company? If so, Storm Shield is here to provide you with expert exterior home improvement services! We provide roof repair, roof replacement, siding installation, and replacement windows, and we specialize in repairing storm damaged homes. No matter what issues you're having, we can provide you with a quality solution. Call us today at 1-513-709-1330 or contact us online to learn more about what we can do for you. We offer free estimates in Cincinnati, Hamilton, Loveland and throughout the surrounding areas. Storm damage is often a major challenge for homeowners, which is why the experts at Storm Shield will help you through the process every step of the way. We use drones to provide aerial inspections of the home, and our pros will be sure that every problem is addressed. We also employ our own insurance claims specialists to guide you through the process and ensure you get what you need. When it comes time to complete the work, we can handle all aspects of roofing, windows, siding, and gutter installation. Whether you need small repairs, a full replacement, or want a cosmetic upgrade, we have the right products and quality craftsmanship. Upgrade your home in Greater Cincinnati with Storm Shield today! 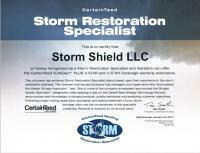 If you want to improve your home's roofing, siding, and windows, Storm Shield are the local experts you need. From roof leak repairs to hail damage to replacement windows, we will ensure your house is fully weatherproofed, functions correctly, and looks fantastic. Call us today at 1-513-709-1330 or contact us online to get started with a free estimate. We proudly serve in Cincinnati, Hamilton, Loveland, Middletown, Mason, Florence, West Chester, Fairfield, Ft Mitchell, Batavia and throughout the surrounding areas.